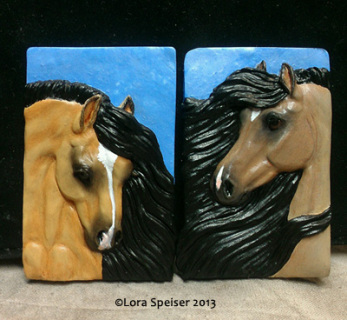 Speiser Studio - What's New? If you would like to see what other artwork is available right now, please visit my Etsy Storefront by clicking the button below! What's New with Speiser Studio? Two brand new mini medallions! 2½ x 1½ inches and ready to be prepped and painted by you! Sold together in a set. You will get both medallions. These mini medallions were sculpted and then molded and cast by me. They are made of the best quality white resin and they are very smooth, ready to be finished in whatever medium you choose! These would make beautiful personalized gift tags or ornaments! Price is PPD by first class mail. Photo above is of finished medallions. You will receive the medallions in unfinished plain white resin, ready to prep and paint whatever colors you choose! One or two openings for July and or August. Please see the Commissions Page.